Blasters & Bulkheads utilizes the popular Goalsystem game engine to allow players to run Space Opera skirmish battles in a far-flung future. 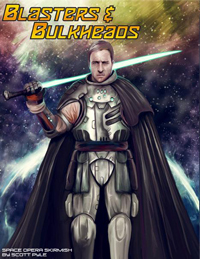 Build a crew of adventurers and ne'er do wells, or command akill-squad of Galactic Hegemony enforcers. Rules for combat, campaigns, character advancement and more allow for story-driven campaigns, and four pre-built scenarios allow players to jump right into the action. Written for both 15mm and 28mm miniatures, B&B requires only a handful of figures for each side. Complete character creation rules let players build exactly the type of fighters they want, and rules for the mysterious Essence allow for the existence of strange powers. Prime your blaster, draw your energy sword, and battle for the fate of the galaxy's future! Contains both color and printer friendly version PDFs. Alexander Wasberg 10 10 10 Great Goal-system release for Space Opera in the style of Star wars etc. Uwe Schumacher 10 9 9 Nice rules for Star Wars-style skirmishes, maybe a little too much dice-rolling. Great henchmen rules! Michael Schroeder 5 10 10 Long time fan of GoalSystem line. B&B is a great addition. Hope to see more from this author. Carles Agullo 10 7 9 good rpg-wargame hybrid, very inspiring. Evyn Gutierrez 7 7 7 Still playing through the 1st few games, so It works, now to fit a universe to it. Mike Lance 10 10 10 a supered additon to the GoalsSystem rules family. VERY full of period flavour. Cute illustrations. clear and easy to follow writting.